Foster's mom announces that she is going to give him 4 VIP tickets to attend a sporting event that's coming to town. The tickets include free entrance, VIP seating, and meals. Foster invites his three closest friends, Lafi, Adam, and Kevin as his guests. The boys are excited. Foster's friend Kevin tells the boys about a bully who has recently been expelled from his school. A boy by the name of Barlow Aldwin Derrick Darden, aka B.A.D.D. On the night of the event a bully is hiding out in the parking lot and tries to steal the tickets from Foster. Foster fights the bully and keeps his tickets. Because it's dark Foster does not get a clear picture of the bully's face. Once break is over and…When Foster opens up his locker to find it full of someone else's belongings, he goes to his teacher to complain. She introduces him to the new boy who just transferred to his school - the bully. Although Foster does not recognize the bully right-a-way, the bully recognizes Foster and has it out for him. The bully terrorizes the school by stealing, taunting the students, disrupting the class…and finally vandalizing cars. 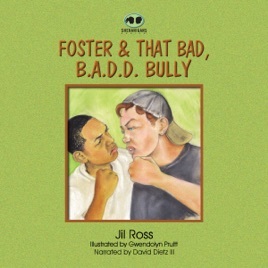 Foster is no fighter but chooses not to stand by and allow his school to be victimized by B.A.D.D. The story is full of strong and entertaining characters.